Dog owners who want to start their own dog breeding adventure rarely know exactly where to start. 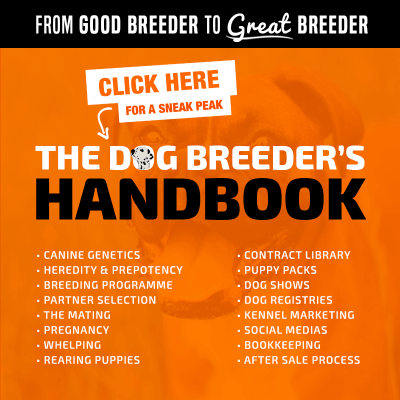 Reliable information about breeding dogs isn’t always easy to access so I wanted to offer actionable tips for beginners who are keen to start their own breeding kennel. This article is not most definitely not our shortest, but you can quickly scan the content as each heading is a tip that is then developed. Prepare an excel spreadsheet and list all of the received health conditions along with the screening method to get clearance if there is any. This is the necessary first step, don’t even think about anything else until you know what health conditions to be aware of! I realized that most dog breeders started breeding dogs with the best intentions but somehow failed during the execution. Now you’ve got a comprehensive list of health conditions affecting your dog’s breed, it’s time to ask the vet for a cost-effective way of checking them all. 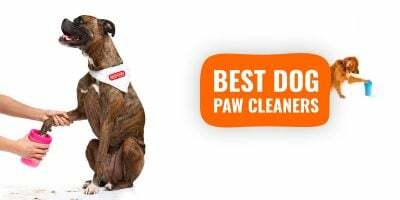 Usually, the vet will try to do everything in one or two consultations with a blood test, an x-ray, an eye test, and an overall check of the dog’s body. This process takes a few weeks depending on how many conditions you have in your list. Also, some conditions that are genetically transmitted can be cleared de facto with no vet check if both parents have cleared themselves. Therefore, if you have proof of such genetic screenings for both parents, keep them because they are just what you need to prove your dog’s genetic soundness. Responsible dog breeding requires these health checks because it’s how it should be done, and because most dog owners are now aware of how important a dog’s health is. They don’t want a dog that will have to go through surgery or heavy medication — they are the ones who will pay the vet bills! So most future dog owners now demand such documents in order to buy a puppy. We cannot repeat it enough — buy books, read ebooks, browse the web, abuse Wikipedia! 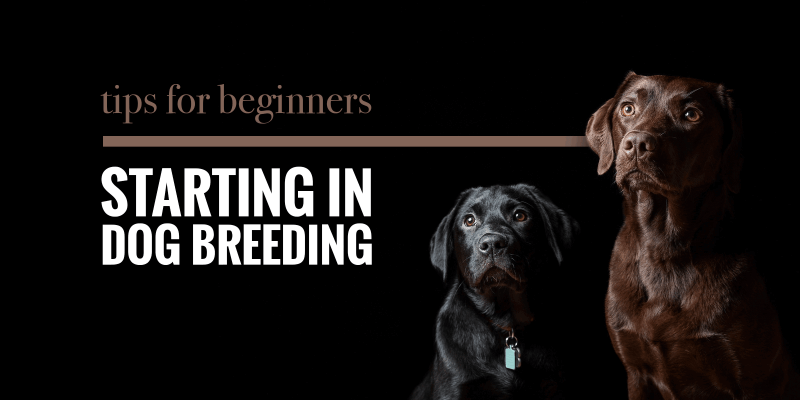 There are so many factors that go into breeding quality dogs that if you aren’t willing to spend hours reading, don’t even get started. Each puppy in a litter has half its genetic material inherited from his mother, the other half from its father. This is not a magic event, so you have to learn as much as possible about canine genetics, and concepts you learned at school that you most likely forgot by now. 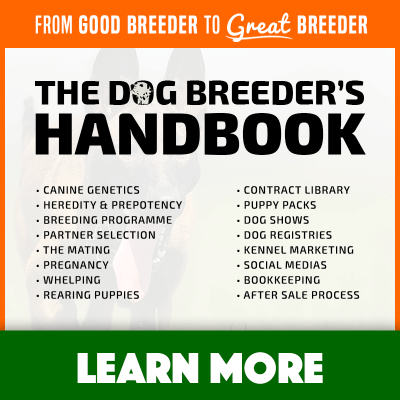 We’ve got a list of the must-read dog breeding books and we have our very own bestseller, The Dog Breeder’s Handbook, with over 300+ pages of modern knowledge about genetics, breeding stock, pregnancy, whelping, nursing, etc. Start learning about dog mating, dog health, dog breeding, and the canine species in general because regardless of the breed you are working with, dogs are all part of the very same species. 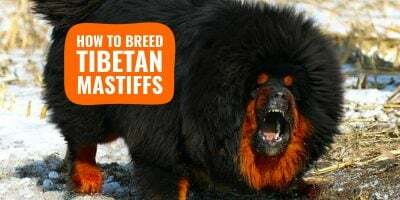 Now that we are done with health concerns, it’s time to move on to another hindrance when breeding purebred dogs: flaws. Officially recognized dog breeds have a breed standard that outlines the physical and behavioral requirements to belong to that specific dog breed. Now, in several breed standards, there is a section mentioning the given breed’s flaws. Some flaws are just unwished for while other flaws are clearly blacklisted as disqualifying flaws; thus, making dogs showing these unfit to be registered purebred contenders in a conformation ring. This list a written that is available for all. However, there are trends in each dog breed and some particular aspects of a given dog breed may be favored or disliked by judges and mentors depending on the era. These are totally arbitrary preferences that will change over time and these are not written anywhere. Therefore, the only way for you to know them is to engage and exchange with breed clubs and ask for the current situation — what’s liked, what’s disliked, and where is the breed heading towards. Perhaps the best and most straightforward way to engage with those who master the breed is to attend dog shows and exhibitions. Prefer national events but local dog shows are a great way to start and get familiar with the rules and etiquette. Trying to show your dogs can be intimidating but if you start at the local level, it’s quite fun and people really help each other. Plus, you will meet knowledgeable breed judges who will give you wonderful feedbacks on your dogs and how they can get to that next level. Don’t just listen to breed judges, observe what the winners have that your dogs don’t and take some notes. Remember, dog breeding is a long process and you begin with dogs that are just a starting point, you want to receive as much constructive feedback as possible in order to reach your ideal specimen few generations down the line. The issue when you attend dog shows is that you are limiting yourself to a small-sized sample. Basically, only those who decided to join the same event as you. They surely are great to engage with but they might not be the most knowledgeable breed experts out there. The Internet is a wonderful place so use and abuse it. Email your breed clubs: local, national, and even those from other countries; ask them for a list of the breed judges and breed mentors. Inform them about your plans to start your own bloodline, tell them about your thirst for relevant knowledge, and they should email you a list of pages to read and people to connect with. Some breeds have hundreds of mentors and judges while others only have a couple of people listed. Email them all because not all will reply. Be honest. Inform them of the direction you want your dogs to take and seek their valuable advice and opinion. They might upset you with what they are saying (especially old school breed fanciers) but process it and learn from it — they generally are correct! 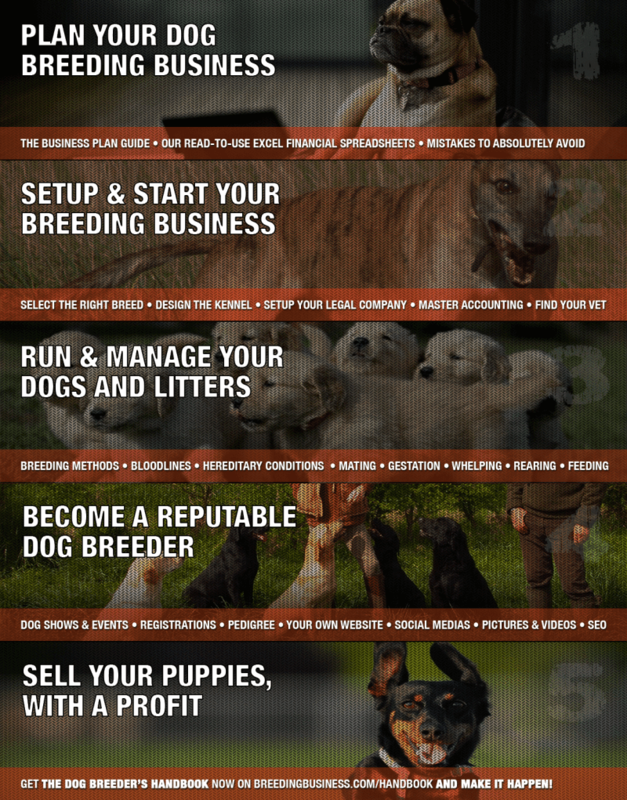 The steps to a successful and profitable dog breeding business. Oh no but wait! Is dog breeding profitable? By now, you probably feel comfortable moving forward with your dog breeding adventure but you are not the first one doing it. Try to learn from other dog breeders who are doing what you are going to do, and have done so for years if not decades. The first step is to arrange visits with local breeders, and don’t discriminate yet on the breed. 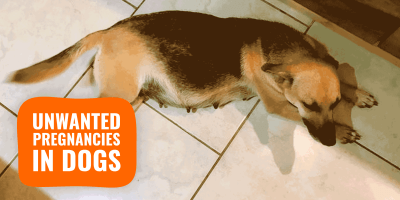 Even if you want to breed German Shepherds, contact and visit local Chihuahua breeders — narrowing down to a specific breed locally is too restrictive and will lead you nowhere. how do they discuss pricing questions? are they upfront with health checks or do you need to ask first? is their website representing well the breeding conditions? are they rushing you or are there tea and biscuits ready? Bottom line, if you do ten visits, you will be facing what you want and what you never want to do yourself. It’s a good reminder of what kind of experience your want your future dog owners to have when they come to view your kennel. If you are involved in dog breeding it is because you want to noticeably improve the breed as a whole. If you are seeking education on Breeding Business, you do want to make an impactful difference and not be yet another average dog breeder. To do so, you need to be ready to answer very difficult questions because if you breed high quality dogs, you will have to deal with very demanding customers. They will want to know how knowledgeable you are. Because if you are not, chances are your dogs may be healthy but not necessarily good for dog shows or to become parents themselves. What’s your end-goal with your breeding program and bloodline? What steps are you taking to get to that ideal dog? Can you send me a list of all the health checks your dogs go through? Why do you think you often land on the podium but not the first place in dog shows? Why do you not feed your dogs a homemade diet? Do you actually profit from breeding dogs? You get the gist. This is just to see how great breeders answer such questions that you will eventually receive, too. For the last months, you’ve been in touch with different dog breeders and dog fanciers from all around the country. If you don’t have questions, you’re doing it wrong. So take a few hours every months to list questions you have and remember, the only stupid questions are those we don’t ask! Facebook Groups are amazing because they exist in the hundreds and have thousands of members for many of them so you will definitely receive a quality answer if you formulate the question correctly. These groups are totally free and well, we’re all on Facebook, so it’s super easy to access, and intuitive to use. The last type of group is great to connect with likeminded people near you: they breed the same dog breed, and live not too far from you. The breed-specific groups accept people from anywhere but it’s specific to your breed. Then, you have more general groups that discuss dog breeding issues and topics, canine health, and dog ownership. The more specific a Facebook Group is, the least members it will have so you need to join a few targeted group to have a balance of quantity and quality. Lastly, don’t be the douchebag who only asks questions but never helps others! Answer as many questions from peers as possible; sharing is caring, right? So far, you’ve reached out to dozens (maybe hundreds) of people and it took you a hell of a lot of time. If you thought dog breeding was a matter of putting two dogs together and waiting for it to happen, you were wrong. By now, you should know what is realistic and what is impossible; what is a priority and what is accessory. The upside, though, is that right the second, you know more than you did at the beginning. You should have a huge amount of confidence in what you are going to do in your dog breeding program. Exchanging with dog breeders, attending dog shows and visiting kennels, all of that cleared the foggy vision you had of your long-term breeding goals, and how to get there. and what do you want to breed out of them. Be concise, and develop each line later, but for now, just put everything you have in your mind. Email it to the handful of contacts you’ve really connected with and ask for feedback and polish that list until it’s set in stone. Only now you can try to acquire breeding stock and find suitable partners to start your march towards that ideal dog of yours. It will take generations to get there, and at each litter, you will have to polish your program and perhaps even revise your ambition, but always your dogs will be healthy and of the highest quality possible. 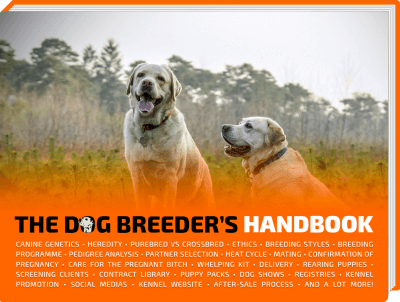 Check out our bestselling ebook, The Dog Breeder’s Handbook! The last piece of advice is fun to do; it’s about documenting your journey from today onwards. Whether it is in a personal diary, on a public blog, or on a social media platform, just make sure you do it. 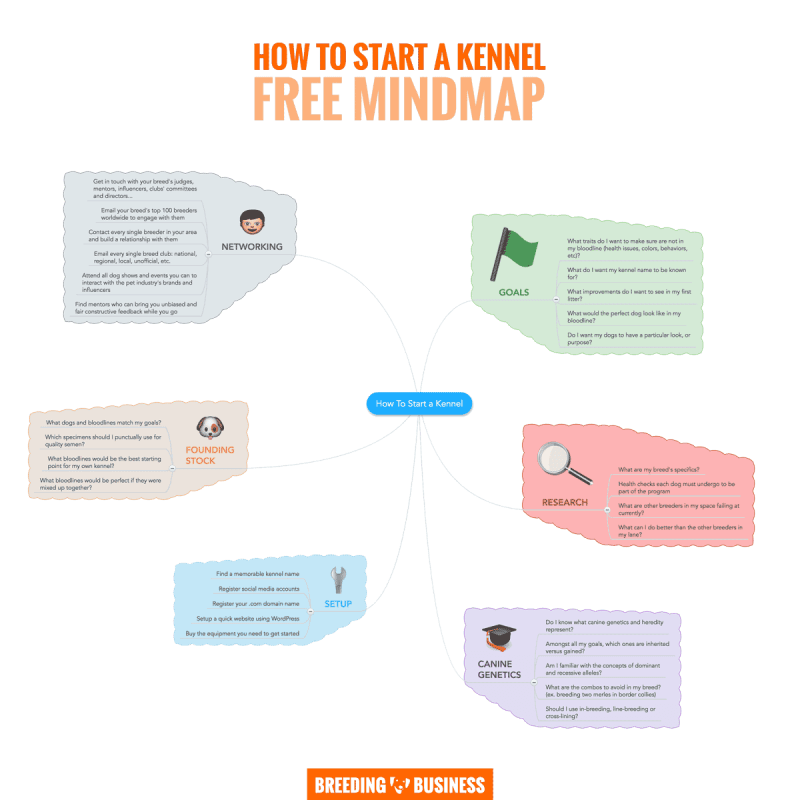 Check out our step-by-step guide on how to create a professional-looking kennel website for very cheap! Be transparent, show your struggles, successes and mistakes. Don’t present a beautified version of your story, be honest. People prefer authenticity to fakery. During all those months of documenting your dog breeding adventure, you will grow a big following that will help you achieve even more once you are ready to start breeding your first litter. Sorry for the long article, but I realized that most dog breeders started breeding dogs with the best intentions but somehow failed during the execution. Because it is such a long process, it’s very easy to forget the goals we set for ourselves, and it’s hard to keep the same discipline over the months, let alone the years. Try to stick to these tips while you are involved in dog breeding, and you should only go one way: upward and forward.